Welcome to this first Friday Afternoon presentation of 2012. We hope the new year is treating you kindly so far! In this presentation, Hugh Fox from the Institute of Narrative Therapy, UK, shares his ideas in relation to narrative supervision. What might narrative supervision look like? What are options for supervision beyond problem-solving? 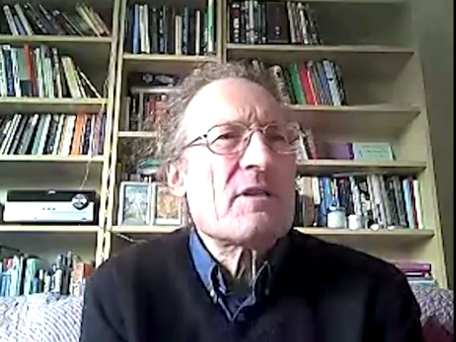 In this presentation, Hugh shares options for supervision including the use of outsider-witness practice and definitional ceremony in order to generate rich description and rich story development. Fox, H., Tench, C. & Marie, (2002). ‘Outsider-witness practices and group supervision.’ International Journal of Narrative Therapy and Community Work, 4:25-32. Crocket, K. (2002). ‘Introducing counsellors to collaborative supervision.’ International Journal of Narrative Therapy and Community Work, 4:19-24. Gershoni, Y. & Cramer, S. (2002). ‘Starting with values.’ International Journal of Narrative Therapy and Community Work, 4:39-41. Simmonds, L. (2010). Narrative approaches to supervision consultations: Reflections and options for practice. The International Journal of Narrative Therapy and Community Work, (1), 18-22. White, M. (1992). Family therapy training and supervision in a world of experience and narrative.’ in Epston, D. & White, M.: Experience, Contradiction, Narrative & Imagination: Selected papers of David Epston & Michael White, 1989-1991 (chapter 4), pp.75-79. Adelaide: Dulwich Centre Publications. Winslade, J. (2002). ‘Storying professional identity.’ International Journal of Narrative Therapy and Community Work, 4:33-38. Hello to all of you who have contributed to the discussion on supervision. I’ve enjoyed reading your thoughtful responses from right across the world. Anne, it’s really good to feel that I may have helped spark something off for you in your journey and helped you in your thinking about supervision. I really liked your account of more richly describing the identities of a social worker, their student and the person being worked with all at the (more or less) same time. What a session that must have been! Troy, I sympathise with your dilemmas in relation to learning therapists. For me it seems to parallel the therapy/social control distinction around child protection etc. Maybe we can distinguish a ‘consultative supervision’ from a ‘formative supervision’? In the former you would be accountable to the consultee and in the latter you would be accountable to who ever provides the internship programme, and through them to all those who may be in a therapeutic relationship both now and in the future with the intern. Maybe it is possible to be clear about this distinction from the start of the supervision relationship so that it becomes possible for both supervisor and supervisee to know which domain the relationship is being situated in at any given time? It sounds like you have developed practices of supervision (getting back in touch with values from which supervisees have become separated by professional discourses) which are experienced as very helpful. I hope the outsider witness process you are contemplating will contribute to a richer description of your preferred supervisory identity. 1. I try to remember that this response may not fit for me but it may for the person. I will ask questions like, What was behind your responding in this way? Do you think it helped in the way you hoped it would? Sometimes the person may say that what they did was a mistake in which case we can talk about what happened and what they would prefer to have done. Other times the response fits with the person’s values and intentions, which opens doors for interesting conversations. 2. I’m understanding that you are referring to questions such as, When the belief that you know the answer to the person’s problem gets hold of you, what does it have you doing, and what do you think about this? Why would you think that? – in order to elicit a preferred account of identity. So that next I can enquire about times when that preferred identity has guided their actions in the therapeutic relationship and what this had them doing. The skills and knowledges involved can be discussed and this can lead to conversations of ability and agency rather than of failure. 3. I think that careful agreement at the beginning of supervision (again, see above) can help to clarify the context, what the role of the supervisor is either in relation to what the supervisee wants or in relation to the requirements of a training context. I would like to add that I think focussing on what the supervisee intends, what they give value to in therapeutic interaction, what their knowledges and skills are in performing these values, is in general more helpful than making visible shortcomings or failings. Thanks, Italo, and thanks everyone for your contributions. Thanks for your presentation. I had the opportunity and privilege to be behind the screen of the computer hearing at you and doing some questions which was really exciting. But while editing the video and having the first draft appears a question that I´d like to ask now. In my understanding, not always the therapeutic responses that therapists give in therapy are always preferred therapeutic responses. Sometimes, in my own experience supervising practitioners and being supervised, has been important to leave room for render visible some of the therapeutic responses that could be having unwanted effects for the people with whom we’re working with. I think this is related to accountability, for both supervisor and supervisee. How have you respond as a supervisor in these situations? What is your experience guiding yourself with externalizing ethics to promote agency and provide a context to practitioners take position on these rather than achieving a failure sense of professional identity? How you have provide a critical context to render visible some of the therapeutic responses practitioners may be giving that may be having some unwanted effects or consequences? I hope my English isn’t a obstacle to understanding my comment. Thank you for sharing your ideas about supervision, an area of my work where I most frequently feel conflicted. Your idea of giving supervision a more narrative ‘flavour’ appealed to me. I am also thinking of the possibility of video-taping a supervision session I am providing and taking the opportunity to be interviewed in front of outsider witnesses as a way of dealing of some of the conflicts I experience. I have been for a number of years an accredited supervisor for conditionally-registered psychologists completing their ‘internship’ practice program. This involves roles of evaluation, education, ensuring ethical practice, support and others. Accepting these responsibilities means a willingness to take an ‘expert’ position in supervision which I am becoming less and less comfortable with. However, being one of very few supervisors in a regional/rural area, I also do not want to disadvantage local psychologists, nor the people who will potentially consult them. For instance, I have had the privilege and pleasure of making small contributions to one person of Aboriginal descent and one person of Torres Strait Islander descent completing the last, but quite intense, step to becoming fully-registered psychologists. With these privileges and conflicts in mind I plan on continuing this particular supervision role. In regard to a narrative focus, in particular I have found conversations about identities of psychologists (and other workers) very useful. It often seems that partly through the influence of various professional cultures and roles, people have become less familiar with the values that inspired them to enter a consulting role. Assisting this to become clear again can make an enormous difference. Hopefully through an outsider witness process I may also become clearer about my own supervisorial identity. Thanks again, I hope to develop an increasingly narrative flavour in my supervision while continuing to meet the obligations I am bound to. Thank you for sharing your ideas and practice around narrative supervision. Your reference to the 2002 journal reminded me of my journey with narrative ideas and supervision practice. I was particularly drawn to the ideas around centering the person consulting(client) and the person coming for supervision(supervisee) and I intend to be more mindful of this in my practice. In a similar way I am beginning to think of the possibilities of clients outsider witnessing the account of work/perhaps as a way of ending work. I most recently worked with a social worker, their student and a client and provided a space for a rich description of the social worker as a practice teacher, the student as a competent and more knowledged worker and the client as an expert teacher of their own experiences of mental health, psychosis in particular. This was with primarily using outsider witnessing. What may have helped in a situation like this when you have mutliple developments of professional identities was to more carefully centre each individual. Anyway intend to give more thought to the development of these ideas and thank you for sparking them off again. I certainly think that narrative ideas and approach can lead to a different perspective for people in supervision and can often be most sustaining. As you say so often people know what they want to do just need some space to feel the ‘expert of their own experience’.